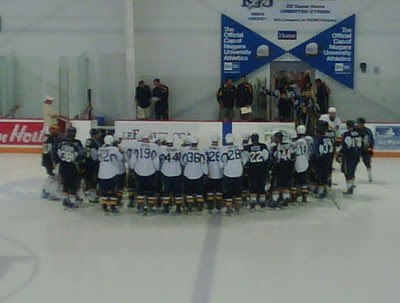 With the Sabres concluding their 2010 Development Camp on Friday, there's little doubt that the 40+ players in attendance rejoiced at the sound of the final buzzer. Temperatures reached the 90's in Western New York, creating a grueling backdrop for a week involving lessons in physical fitness and on-ice drill work. The action was tighter on Thursday, and needless to say the play was somewhat sloppier by the time Friday's scrimmage took place. I can't imagine the Sabres are looking for excuses about players being gassed though, as the development camp is a large part of their team building strategy. The old days of drafting a player and hoping he develops with his amateur club are long gone. The organizational coaching begins immediately and continues throughout the season with video, mid-stream visits, and phone calls. Jobs aren't won or list at these sessions, but it's in the players best interests to leave everything they have on the ice including pools of lactate. - There's not really a ton to note on the goaltending front. Jhonas Enroth continued to be the pacesetter, showing good angles and a refined "paddle down" approach as a result of the week's work with Jim Corsi. He's getting better at challenging the shooter....The closest to Enroth in terms of size and athleticism, North Dakota goalie Brad Eidsness exhibited his sharp reflexes and technique in drill work, and made a few decent saves in the scrimmages. A couple juicy rebounds were kicked back, but for the most part no egregious positioning errors were recorded...Nick Eno appeared to be fighting the puck in the Thursday scrimmage. but was more composed on Friday. He's a big kid who can hold ground in tight, but his puckhandling is still a little suspect....The biggest goaltender in the system, Connor Knapp kept it simple by covering most of the net and steering most of his rebounds. He played the puck well aside from a gaffe in the Friday scrimmage that created a goal against. He's got the size and mechanics, but his hang up will be quickness. Pekke Rinne is an athletic freak, but regardless he is the NHL standard for big goaltenders. Of all the positions, goaltending is the hardest one to gauge at these off-season camps due to the lack of action and rhythm leading in. - Definitely the case on Friday, T.J. Brennan may very have been the best defenseman throughout the entire camp. Good at moving the puck north-south, Brennan got more involved over the course of the two scrimmages. His defense looks sturdy, with his 6'0 frame and added upper body strength creating a situation where he can drive upward on a guys chest with his forearm to break up plays. He got turned around and caught watching when Corey Tropp made a great feed to Luke Adam on Thursday, but overall he committed few mistakes and looks to be a guy who is more in-tune with how to pick his spots matriculating the puck. If I'm looking at year-over-growth, Brennan was most impressive. - I really enjoy watching Marcus Foligno patrol the zone and finish his checks. His pivoting has vastly improved and his pursuit routes are where they need to be. I'm less enthused by the hat trick he posted in Friday's scrimmage, and more excited by the feeling that Foligno may very well be future letter material. Regarding his offense, Foligno will collect loads of rebounds and tap-ins inside the hash marks. Frankly, I think he's more effective when he doesn't need to think about making a play. He lined up at center this week. He's not even 19 yet, but I really like where his development is heading. - Similar to previous viewings, Chilliwack's Kevin Sundher competed and created at a high level throughout the course of the week. Sundher looks good entering the zone, using his body and lateral movement to create angles for additional passing options. Just a very aware player wired to produce under pressure. His shot is pretty accurate, and it's clear that the Sabres have themselves a natural center option brewing. - Brayden McNabb is going to be a tough cut for Team Canada this winter. The simpler the better - both physically and offensively. He's solid in front of his net, and he works hard to keep the puck down low in the opposing end. When Chris Butler wrenched his back on Thursday, McNabb was traded between periods to assume his spot on team blue. - 2010 third-rounder Matt MacKenzie looked like a camp veteran out there. Sure being a late-'91 birth date may have something to do with it, but his composure and vision were top notch. He scored a beautiful backhand goal on Thursday when he shot in the left lane and roofed it stick side. I like his level of engagement and thought he communicated well with his partner. Not a lot of flash, but very good overall. - A pair of recent signees, Luke Adam and Corey Tropp, lined up with Nathan Gerbe for what was perhaps the best juxtaposition of skill sets in camp. Gerbe motors, Adam gets space, and Tropp battles. All three can shoot. If Gerbe goes down to Portland to begin the season, here is one of your projected scoring units. Adam continued to consistently swoop into scoring position and get off his thick shot. Tropp went hard, faring well one-on-one to both distribute and get shots off. - Christian Isackson has the vision and offensive understanding to get the job done. An excellent passer, this kid has good hand-eye coordination and understands how to use the space that's given to him to better use his teammates. The future Gopher made a few nice set ups in the Friday session. If he can improve his first three strides and hit a higher top end, expect Isackson to make some noise in the WCHA down the road. Nothing short of an excellent find by the Sabres Minnesota bird dog, Nik Fattey. - Gregg Sutch was very businesslike all week, showing good puck control skills and strength on the forecheck. Nice framework for a checking line forward. He made a nice play in Friday's scrimmage to get to the crease on Knapp, but couldn't slide the puck past the wall. Had a wraparound attempt as well that rolled on him. - Aside from guys like Ennis, Gerbe, and Byron, Jacob Lagace may have the most talented set of shooting hands among the forward prospects. He was automatic in drill work from between the dots and he worked to get to front of the cage. When the real action takes place, I still have lingering concerns about his play away from the puck. He's going to score his share of goals for sure, but whether it's at the AHL or NHL level will be determined by his desire to pay the price to light the lamp. - A full season of regular ice time and weight room activity in the USHL has had a positive impact on Roo Adams. He's looks bigger and more adjusted to the flow. He did commit a stick penalty in one of the scrimmages to compensate for a guy getting past him, but the coaching of Tim Army and David Berard should greatly benefit the big kid over his career at Providence. - Another NE prep/USHL product, Drew MacKenzie, looked a year wiser. A straight forward "classic defenseman", MacKenzie is steady and good at staying within his box. Guys that do too much get exposed and he rarely does that. - The youngest player in camp, Jerome Gauthier-Leduc has some things to work on but clearly has the tools to generate offense down the road. Good feet and a decent defensive foundation in place. I think he understands and is more committed to his defensive responsibilities than Marc-Andre Gragnani at the same stage, but I'd be lying if I didn't deem the few shifts he had paired with Dennis Persson as adventurous. Granted much of that was due to Persson coughing the puck up twice within their first :20 together. As a whole Gauthier-Leduc didn't seem to get overpowered along the boards and made good decisions to get the puck out of his end. - Mark Pysyk is smart, smart, smart. He goes to the right places positionally and is decisive with the puck. Real good vision. His skating is smooth and effortless as if he's on rails, and his shot stays low and gets through. When the going gets tough, I expect Pysyk to adjust with a conservative yet effective style. No issues from last season's foot injury. - Zack Kassian is simply a specimen. Long arms and torso and thick as a tree trunk. He carves the ice at every turn, and while his feet generally stay moving, I've yet to see an extra gear (both ways). He can pump a shot and he showed some deft little puck plays, but overall there wasn't a ton of intensity in the scrimmages when guys like Travis Turnbull and Maxime Legault were tossing their weight around. - The unit of Legault-Turnbull-Riley Boychuk was quite physical. Solid at the dot, Turnbull always looks good in these camps. Legault put forth a consistent drive and finished what he could. Boychuk has some skating work to do, but his size and shot as a 19-year old are a welcome addition. - I can't say that Justin Jokinen put forth a better effort than last year's camp, but I'm getting the feeling that he's just getting started. You see the size and basic offensive elements, but he needs to put it together this season to validate the package. A few times he entered the zone and appeared to pull up and think about what he wanted to do, giving the defender time to close on him and force an unfavorable outcome. He can fix this and I think it will happen with increaseed ice time as a junior. - Steve Shipley didn't do a ton to get noticed. He made some decent effort plays in drill and width-wise shinnies on Wednesday. His feet will drive his compete moving forward, but you can see offensive elements. - I thought Nick Crawford displayed his cool nature on the ice. Another guy who communicated well, Crawford is patient with the puck and good with his angles and gaps. He was a shutdown guy in the OHL, and it'll be interesting to see how he takes guys coming at him at top speed in the AHL. His upper body will need a little work. - I mentioned Drew Schiestel's agility on Twitter. Looks to be more in control with the puck. Good shot, but like Brennan, didn't get many chances to pop it off. I expect gradual improvement defensively in year two. Consistency is the key in his own end since he has little issue helping push it up ice. He loves his forehand/backhand deke on the breakaway. - Cedrick Henley is another long, lanky player who can go nowhere but up. He's pretty average with his skating and stick skills in his 6'5 frame, but his presence at the edge of the crease can cause trouble for the opposition. That alone should see him score 15 goals in the QMJHL next year. - Paul Byron did not attend camp due to a bout with mononucleosis. Tough blow for one of the speedier, more offensively talented Pirate forwards. Byron joins Brad Eidsness, Corey Tropp, Luke Adam, and Drew MacKenzie as players to battle the infection after being drafted by the Sabres. - Another skater, rearguard Corey Fienhage, was in town but did not see the ice due to a foot injury suffered in summer workouts. Fienhage recently bolted the University of North Dakota to see more playing time with the Kamloops Blazers of the WHL. Feel free to fire questions about guys not mentioned or if you need me to expand on anything above. Next up, the adjusted Top 25. I for one thought Foligno, Tropp, Adam and Adams were the most improved over last year. Foligno and Adams seemed to start to catch up with their size and the pace was not an issue. Foligno will though never be a shoot out guy, if you know what I mean. Adams sakting was still very strong and his D play was up a notch or two. Tropp jumped out at me the very first day and continued all camp. He has the pro type body for sure. Adam is a lot like Lucic, not a great skater but somehow gets there and sure can finish. I agree with Brennan being the best day one to the end. With Kassian, does his lack of a top end gear cause any concern with the Sabres? I saw that in the last Memorial Cup. 2:56 - pretty much spot-on. Adams is just getting going. I want him to meet the attack and gain better gap control. His improvement down the stretch with Chicago was pretty significant. With continued leg strength and work on his stride, Foligno is going to be the lunch pail guy four years from now. If the Wolves aren't in serious contention, I'm thinking that he's a big time trade chip out of Sudbury now that his father has moved on to Anaheim. Send him to Mississauga to play with Sutch. Adam's footwork has come such a long way since his days with Allard and Brennan in St. John's. I think he'll be legit by mid-season. The Sabres don't have many guys like him who can fill it up. Yes, Pysysk and MacKenzie were excellent. I thought Gauthier-Leduc showed promise with his fundamentals. He is still 17. I'm thinking he's a pretty good player when he's 20. JGL is pretty much last season's version of Foligno in terms of their youth at their first camp. If Foligno showed marked improvement as a 17->18, then it's not far off to think JGL is a serious contender for Team Canada at the 2012 WJCs. Kris: saw the thurs. scrimmage. I;m still high on biega. great puck handler and good along the boards, may have trouble in front of the net.Really like how he slows the play and would make a good pp qb. your thoughts? The Kassian observation is more about the need for him to be a straight line forechecker than anything else. They drafted him for so many other things that it's not really a deterrent because he generates so much momentum and has proven the ability to finish his checks. I don't think he's slow and I don't think he's designed to take the puck from end-to-end anyways. He has shown the ability to take guys wide too. He just does it with strength and not blazing speed. Doug - Biega has decent all-around tools; looks to be a solid support guy for Portland. He's always been a strong skater. This week he definitely showed transition capabilities. I can't say he makes it ahead of upward trending an Brennan or has the total potential of a guy like Schiestel, but he is certainly in the mix as far as a bona fide two-way defender goes. He's smart enough to over come the lack of imposing size, but there will be times when he's overpowered, so excelling on the PP will be one of the value adds. As of now, I can see him at least getting time on the #2 unit. It's all about smarts and punching shots through. Sounds like they are one stud forward away from having a really strong prospect pool. Lots of potential on the backend with both stay at home and puckmovers. Goaltending is solid enough for now and up front they have have really started to address the size/grit/compete factor that has been missing. A couple more skilled forwards in the prospect line would be ideal but there are a lot to like overall with this group. Portland should be fun this year with a lot of guys with a chance to step up and make an impression at the pro level. looking forward to the Top 25 rankings. Kassian got caught up the ice a couple of occasions on Thursday & seemed to have almost no interest in backchecking. His hands need work too. Anon 5:50 #1 - the blueline is going to get interesting over the next three/four seasons. A lot can happen. And yes, adding forward skill is 100% necessary. I thought they'd bite this year, but at #23 they did what they had to do and walked away with good player. I'm still aggravated by missing Sheahan, but am perfectly ok with Pysyk. Anon 5:50 #2 - he did come off as a casual. I put a lot of weight in how a guy practices. As far as the hands go, improving those is a bonus for a guy employing a power style but a definite must for a player chosen 13th overall. Hi Kris. Do you think that Luke Adam & Marcus Foligno will play center this upcoming season? 9:39- Giving Luke a shot down the middle would make sense given the need for a big body there, but it all depends on the types of vets brought in. I honestly prefer him as a power center. I approached the draft preview with him as a wing thinking it would be easier to get his pro engine revving with a simpler defensive role, but he has center experience and there is a need. He'll produce wherever they put him. In Sudbury, it may be best for their offense to again pair Foligno up with McFarland down the middle. Marcus elevated his point production last season once he slid to McFarland's wing. Maybe they put recent OHL pick and high scoring Russian on the other side? If Foligno keeps improving his skating, he could be one heck of a center option down the road. I'm all for these guys playing the middle in juniors. Get the experience and see if it the position sticks. After all, anybody can play wing. I addressed Biega earlier in comments. Rarely went d->d. Several times hit a forward cutting east/west thru the neutral zone with a crisp pass right on the tape. With Schutz, he'll continue in the mix as a depth player. He's still carving out his role. I don't think he's big or physical enough to play the fourth, and he still needs time to hone skills of a third liner. I'm not factoring in Dineen's clear day roster decision when determining what happens in 2010-11. Clean slate. Great writeup as usual, Kris. We talked about your observations of how the D were working breakouts during Thursday's scrimmage. I didn't see any mention of it here, but I'm sure your readers would like more on what you noticed. I started hinting at it with the Biega comments, but there seemed to be more of an initiative to push the pace from the blueline. I'm not sure if that was coached or a product of natural instincts, but defenders weren't going d->d as much. They were quick to hit the wheel spinning across the neutral zone. The forwards were doing their part keeping flow. Seems like a basic breakout observation, but it was a noticeable trend regardless with Biega, Brennan, M. MacKenzie, McNabb, and Schiestel all starting similar plays in the scrimmages. A few times the puckhandling dman didn't even look in his partner's direction. 11:14 - Brennan's D was definitely tighter against his peer group this week, but the spike needs to continue for another season before he's ready for prime time. He's got a good two-way blend going with his athleticism and response to coaching in his own end. Who better than James Patrick and Eric Weinrich to mold Brennan into an NHLer? I've done a lot of thinking about the "Tale of Two Darcys" when it comes to his scouting departments, especially in the weeks leading up to the draft. It's hard to hammer the earlier era because they made some very astute picks, but one thing to consider is that the draft has shrunk to seven rounds now. The screws are put to amateur scouts to get quality prospects, and this creates less margin for error for a Sabres club that primarily develops from within. I think that factors into some CHL overagers being taken in the 7th round. Maturity and deeper track record weighs in versus a longer-shot NE prep guy (as an example). the sabres' draft-picks who have moved on the past few years include: soupy, kalinen, max, novotny, kotalik and tallinder as well as prospects like zags, gogs and bartovic...there are early round busts like kryukov, fabry, hietsen and possibly persson...all of them fall into the aformentioned euro-temperment.. Regarding Kassian, do you think they may have told him to tone it down in the hitting department for camp since it's pretty clear he knows what he's doing in that regard? That and they don't need another instance of Kaleta-Byron. Any indication of if Legault or any of the invitees (Roloff in particular) have the inside track on any of the many open slots in Portland? the guys who were not using partners on D did so to try and stand out. Typical in sitruations like that and not a bad thing. Would do as told in game situations. 5:07 - agreed on your points. I too have liked what they've done. Their success in the WHL especially stands out. But I know where you're coming from for sure. The Sabres had to adjust. They knew they had to get bigger quickly. That's why there were ok sacrificing scoring to get Kassian's element so early in '09, and why that entire class was 6'2+. That carried into this past draft as well. Dave - I don't think they told him to tone it down. I think he was just approaching things too casually. The hitting comment was just an example. He had stretches like this year where you want to see a deeper level of engagement on each shift. Take those :40 and go hard. Go back to the bench, catch your wind, then do it again. I don't think that much is expected on Portland guys until closer to camp. It was good for Dineen to get a closer look at Roloff. I'm sure he likes what Legault can do. 12:07 - not criticizing the guys who were looking up ice at all. I liked seeing the sharp passes out of the zone. If it's there, send an aggressive beam every now and then. I preach simple D, but most of the guys doing it were guys who can hit the tape. Time and a place. Not a bad thing at all. I'm always impressed every time I see Turnbull, not just at camp but when watching Portland games also. He's tough, he battles, and he has more offensive ability than Goose, McCormick, and Ellis (when Ellis was with the club). I would rank him ahead of Byron and Schutz as far as centers go. Byron plays differently but I prefer what Turnbull brings. Turnbull is definitely committed to each shift. He's very passionate. His style is welcome and I think he's in a good depth spot with the organization. Take that energy and put it into Kassian...hard to imagine how good he and the team could be. Turnbull should be licking his chops heading into Portland. Depending on team needs, a quick start could see he position himself nicely among early season call-ups while Adam and Tropp get their pro footing. That's definitely something to think about. I don't know if he's someone that can stick, but he's surely ramping up into a guy who can fill in when needed. Ranking him above Schutz I can agree with, but at this point he's 24 years old and entering "out of scope" status in terms of the site. As far as Byron vs Turnbull goes, that gets tougher. Paul's speed and playmaking potential are so high that there's a still a chance that he overcomes size issues with a little more time. Turnbull pretty much is what he is at thsi point, and that's not a bad thing. hypothetically speaking, if the sabres traded jhonas enroth as part of a deal for a #1 center, how much short and long-term damage do you think they'd incur at that position? not very encouraging? you do realize that there are different roles that need to be filled and that you only win The Stanley Cup with a balanced team. Sure guys like Ennis are higher profile and exciting, but dont count out the third and fourth line guys like Turnbull either they can be huge assets to a team in plenty of ways. In fact, those are the guys that usually come up big in the playoffs. Kassian up front and McNabb, Gauthier-Leduc, and Pysyk on defense are all going to the Nats invitational selection camp in August. Outside of McNabb who you have already touched on, do any of the other three have much of a chance this year of suiting up for Canada at the WJC's? Should be an interesting preseason because that could be the deciding factor on whether Gerbe or Ennis both make the leap. Sure Ennis is better, but I don't see Gerbe giving up that easily and this is also the last year of his rookie contract, which doesn't mean much but I can bet he won't be happy if he's back in the AHL to start the season. Seems to be only one forward opening on the roster as of now, but remember we moved Paille at the beginning of the season so I wouldn't mind the idea of moving Stafford, putting Kennedy back on a line with Roy and Vanek (which worked out good last year despite having 2 left wingers), leaving some openings at LW for both Gerbe and Ennis. Dave makes a great inquiry. Jumping off his question.. If any which prospects would you predict that we see at the world juniors here at the end of the year/early 2011. As always, great work KB! kris, interesting blog you have, just saw it today...Question. Do you ever look @ Lindy Ruff and wonder why so many players fail to develop under his 'system'? I have nightmares about a Drew Stafford going to a team that lets him do what he can do best (based on when they drafted him) and we end up with zilch again. Max afinogenov...Geoff sanderson...two talented guys who were muffled by the system (which hasnt won a Cup in 12 tries) but showed what they could elsewhere. Kris some guys are one dimensional (scoring) and weak elsewhere. Lindy cant see the need for one or two such on a team...dont EVEN talk about backup goalies! How many games does the average no. 2 G man play around the league, and jere? Random stuff I know but I wanted to ask. Agreed on Gerbe being the best at camp and he seems to be every year. He's paid his dues I think and he grinds more than Ennis ever will, but Ennis is so slick and agile. I think it's a harder decision on who make the team than people think. Speaking of Gerbe, if his groin can hold up, he might be an interesting option breaking in on the 4th line if he can work as hard as he did in the playoffs. Make contact, contest all pucks with his quick hands and feet, and go to the net. They clearly were lacking speed on the forecheck and he can provide that. That said, Ennis seems to have a leg up for a higher line position given his season-ending production and health. 11:10 - I really can't get behind the thought of trading Enroth. I was a proponent of keeping him engaged with the back-up spot in the final year of his deal, but 2011-12 is his year to be that firm #2. That said, I'm 99% certain that you'll see Enroth multiple times this season - not because of injury or Lalime's poor play, but because they are going to make the commitment to working him in. It sounds like he's part of the plan. Trading him now drastically diminishes depth at a key position. I'm desperate for a #1 center too, but I fight tooth and nail to keep Enroth until one of the other three (Eno, Eids, Knapp) steps up and takes control of the situation. I'm more than comfortable with him getting a solid look at being the bona fide safety valve for Miller. You may not need him immediately, but moving Jhonas at this moment seems premature. World juniors...Pysyk and JGL are likely a year away. I'm not counting Pysyk out just yet. He's good enough to play in this year's tournament on the bottom pair, but Canada has some impressive numbers on the blue. I really do think Kassian has a great opportunity here. I expect him to be extremely motivated in Newfoundland when their Eval Camp gets off - by both his country and the feedback he received from the Sabres. 5:57 - I'm off to bed, but check this link out regarding back-up goaltending stats and playoff success. Kris, thats an interesting read about the #1 goalie issue. Definitely a trend, but what's behind the trend? I'm going to analyze this further (at some point) and break down what it means. My hypothesis is that it has less to do about the goalie than it does studs up front and on D. A worthwhile discussion though. (I have a rant against stats. Numbers are what they are, but what do they mean is way more imporant. Too many people simply look at a number w/out analysis of why those/that number(s) are what they are). on an unrelated note, it'll be disappointing (in a sense) if the Sabres have only 1 or 0 prospects in the 2011 World Junior Championships. Kris - I asked this question once before but all I remember is Schiestel.... who amongst our defensive prospects do you think is capable of going coast to coast with the puck on a regular basis, not just once in awhile? Could you please take out Gogulla when the new Top 25 rankings come out please. I don't think he deserved to be in Buffalo's top 25 then or now!!! 6:40 - coast to coast I'm not so sure of. Brennan can start to push it up ice, but he's been coached out of that some. When Gauthier-Leduc really starts to sink his teeth in a little bit, perhaps you see him look to take it to the house, but right now he's more of a "vision" guy who makes plays from the point. 7:32 - In terms of skill, Gogulla definitely belonged in the top 25. To your point, I think you'll be satisfied whenever I decide to post the new rankings. I have little patience for guys unwilling to earn a spot at the elite level. Europeans need a year to adjust. He didn't give himself or the organization a chance. Just my opinion. Hey Kris, Darcy tried to justify the waiving of Kennedy and talked about money and the number of guys on the roster, but do you think there was any side-motive involving prospects they want or think is going to step up and be better? gerbe i think has more upside than kennedy. the issue was more about a two way contract than money. if he wasn;t from buffalo you wouldn;t have heard a peep. hats off to regeir for having big balls. i'm really disappointed with bucky thank god he;s not the gm cause they would be in the toilet. Haha, I think Bucky forgot they HAD to sign Kennedy to what he was awarded - "Regier was willing to accept the award immediately afterward..." Still bothered that the team is well under the cap and is still "over budget." Though next year it'll be interesting cuz I don't see them renewing with Connolly, Rivet, or Stafford, which will free up even more cap space. stafford had some real concussion problems last year. he has a lot of upside and i think he may have a big year. i think he needs some slack. i loved kennedy's moxie but he was to darn small.